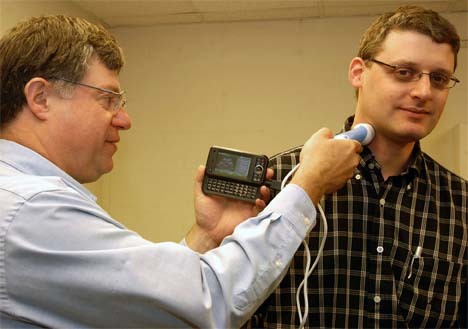 A small handheld ultrasound probe used in conjunction with a Windows-based mobile phone may provide proof-of-concept for what amounts to a 'tricorder' like those seen in the 1960's era Star Trek television show. Washington University computer engineers have tweaked every aspect of ultrasound probe design and operation - from power consumption and data transfer rate to image formation algorithms. 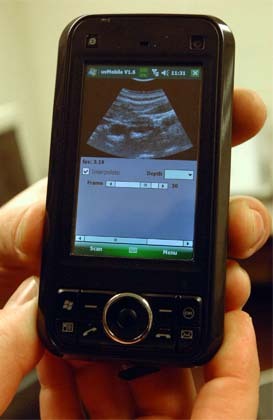 The result is a smartphone-compatible USB ultrasound probe. This can be plugged into a standard Microsoft Windows mobile-based smartphone and the operator can immediately image the kidney, the liver, the bladder and the eyes using the screen on the smartphone. It is also possible to use ultrasound endocavity probes for prostate and uterine screenings and biopsies, and vascular probes for imaging veins and arteries for starting IVs and central lines. "You can carry around a probe and cell phone and image on the fly now," said William D. Richard, Ph.D., WUSTL associate professor of computer science and engineering. "Imagine having these smartphones in ambulances and emergency rooms. On a larger scale, this kind of cell phone is a complete computer that runs Windows. It could become the essential computer of the Developing World, where trained medical personnel are scarce, but most of the population, as much as 90 percent, have access to a cell phone tower." "The idea is that caregivers, who otherwise have to transport a young person, often wheelchair bound, to a hospital or clinic on a regular basis for examination, can be trained to do ultrasound to track muscle condition. The caregiver would only have to do a one-minute scan, transfer the data captured to the clinic, and the results would come back to the caregiver." 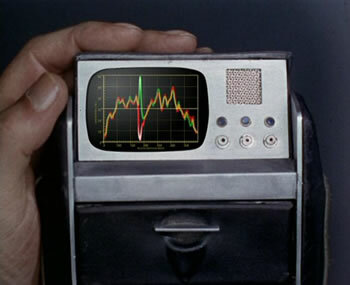 Tricorders were used by physicians in both the original 1960's Star Trek and the more recent incarnations. The nice graphics below are from (I think) the original series..
Handheld devices for doctors are no longer medical science fiction. Progress is rapidly being made in this area; physicians already have the LOCAD-PTS Handheld Microorganism Detector (tested aboard the International Space Station) and life sciences personnel have the NUGGET (Neutron/Gamma Ray Geologic Tomography) device for finding alien life forms. From News Info via Medgadget.